I had a busy weekend! Mr. T and I got up and drove to Dallas. I took the wrong toll-way. This is not surprising since there is insane construction at the exchange and I was arguing with the GPS. First, we went to visit Erica and meet her new baby Landon. He is so cute! I love babies. I was more focused on holding the phone properly than I was smiling… but T taught me that the volume button takes pictures! I didn’t know that! 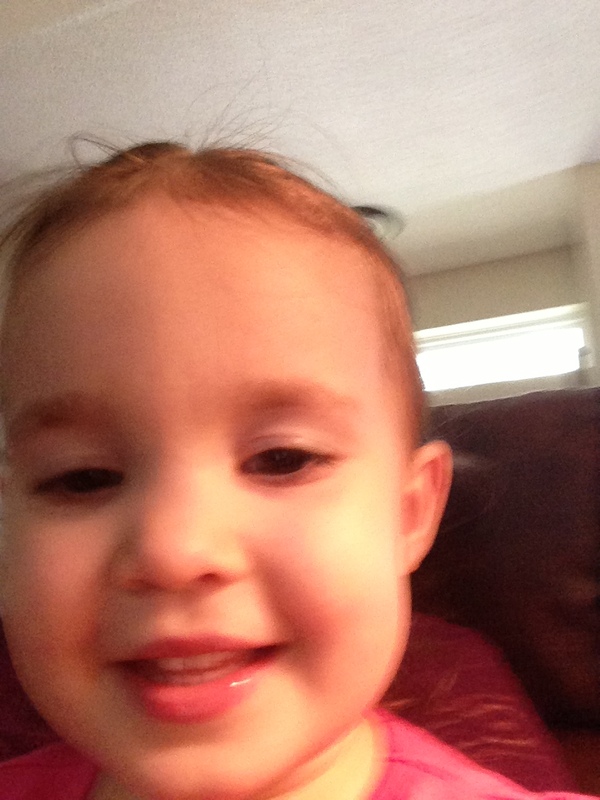 Her daughter Em playing around with me and the camera! 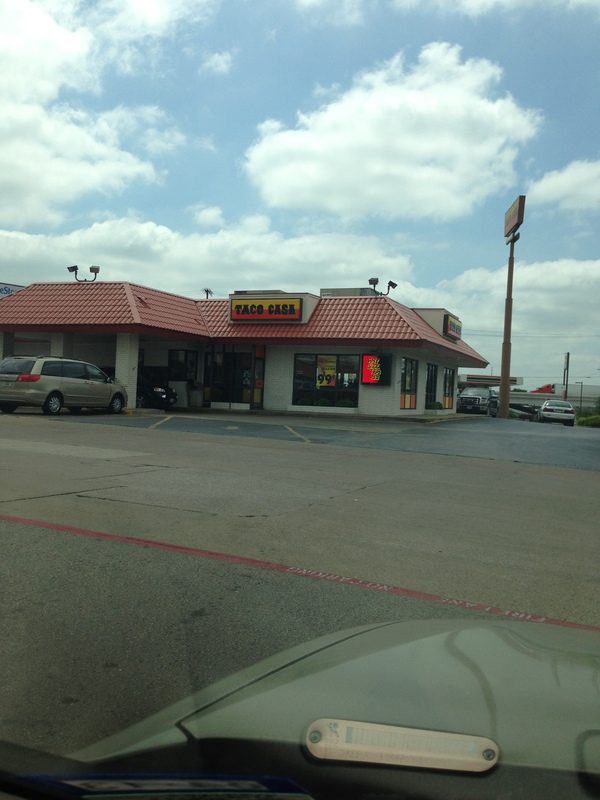 Mr. T and I stopped for lunch, and I took a picture and beamed it to Erica cause I knew there was a Taco Casa by her house, she just hadn’t found it yet. I don’t think the rest of the country (and Canada) has Taco Casa, and I’m okay with that, cause it just means more for me!!! You don’t know what you are missing!! After fueling up our bodies, we headed downtown to Fair Park. 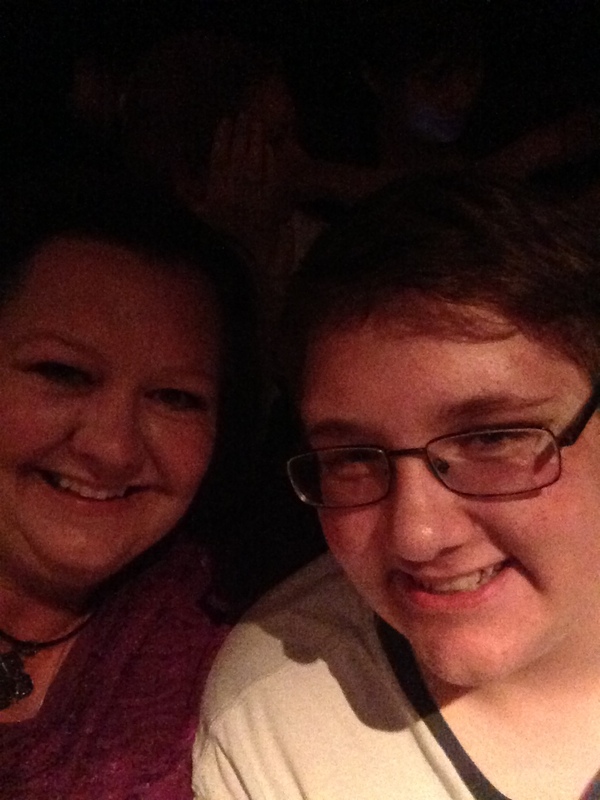 A few months ago I bought us tickets to Wicked, the musical. I splurged and spent the $15 for a ticket for valet, too. So worth the $15!! I loved being able to just get out of the car and not worry about finding a place to park! The view from our seats. 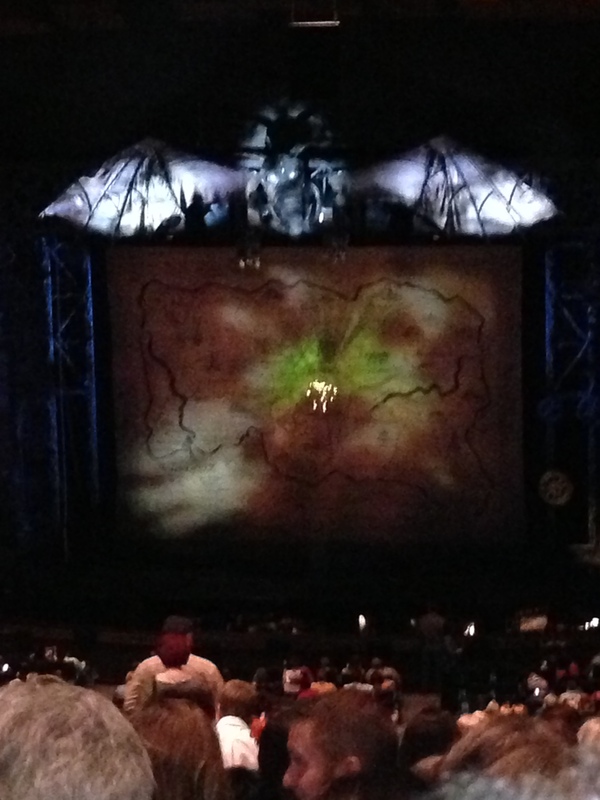 We were pretty high up, but we had a clear view of the stage so that was really nice. Mom and dad saw this play on Broadway and both really liked it, and T and I have been looking forward to this for months. It was so very good!! I was reading the Playbill and several of the cast members were from the original Broadway cast, so that was pretty cool! Now, just minutes before the show started mom texted me that Lee was out of surgery, so several hours later, and as long as we were already in Dallas, Mr. T and I stopped by the hospital to say hi to them. What I didn’t know was that as soon as Lee was out of surgery and back in his room, something went wrong and they had taken him right back to the OR. We arrived just as he was getting back to his room, again. So, we waited. Eventually mom and dad got to go back to his room to see him and then dad came and got T and I and we went back to see him. Bless his pea-picking heart. Poor guy has been put through the wringer. He was taken back originally that morning because his LVAD clogged up. They put on a new LVAD, removed the RVAD and put him on ECMO. As soon as he got back to his room they discovered that the LVAD and ECMO were not synced up properly, so they took him back. 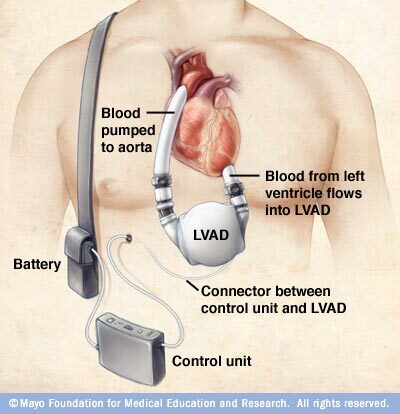 Lee is the first patient that they have done the LVAD and ECMO at the same time. Have I told you that yet? Anyway… after seeing him and hugging mom and dad, we made the long drive back home. We got back to our side of the world and ran by my parents house to gather up some things they needed and left them for my Uncle to pick up and take to them. That was when Mr. T and I decided we were hungry again! It was dinner time after all! My view from the dinner table! 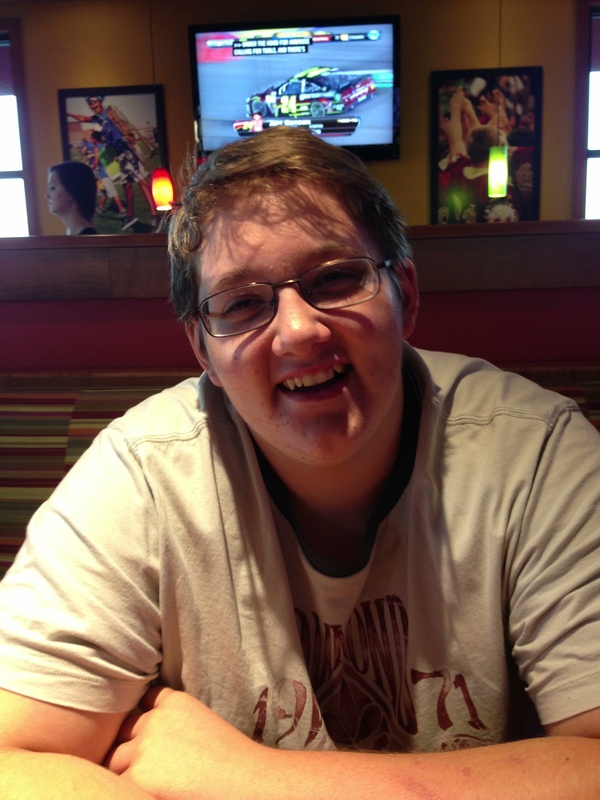 We enjoyed a nice dinner out – and I had a coupon for a free dessert! The restaurant doubled the dessert!! Instead of one serving, they put two on the same plate – so we didn’t really have to share – we got our own! It was the perfect way to end the very busy day! Sunday I rested. A lot. Well, I did laundry. I cleaned the kitchen and my bathroom. I pulled a lot of weeds. But otherwise, I rested. My buddy BA came over and helped with the yard work and mowed, weed eated and trimmed the big bush up front. I felt so much better once that was done. I was too physically wiped out to do it and with T injured, there was no way. So, I’m glad that I have great friends like that who can help out. He stayed and had dinner with us, and we laughed and had a good time. It was the perfect way to end the day. It was a good weekend. And I highly recommend Wicked – and Taco Casa! We’ve all asked this question. How fast can I go down the freeway? How fast can I go through the grocery store? How fast can I go and get all of my work completed? I bet you probably ask yourself this question more often than you think! Representation of Mr. T on his bike. My son asks himself this question while on his bike. I don’t blame him for asking this question, I understand the thrill! Many years ago, we were camping with my Amy’s family. It’s a big group and we always have fun, and we took Mr. T’s bike. Well, my Amy’s brother Mitch came back and was laughing so hard he had tears streaming down his face. Apparently, the gravel hill leading to the lake looked good to Mr. T and he pointed his bike at it, gathered steam and yelled “Geronimo! !” and hit the hill. Did you catch on to the fact that I mentioned gravel? Shortly after yelling “Geronimo! 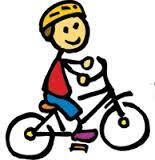 !” and taking off, his bike hit the gravel and head over heels he went and tumbled down the hill. He wasn’t hurt too badly and we have a great story that gets relieved pretty often! Mr. T asked himself this question Wednesday afternoon, at the top of the street which has a nice, gentle incline. Or decline, depending on which part of the street you are standing. Or riding your bike. Naturally, this would be the night that T said he didn’t need his phone, so I’m sitting on the couch, working actually cause I’ve been busy doing other things for the family, and there is an insistent knock at the door. Before I could get there they were knocking again. I answered “Are you Kate?” “yes” “Your son is hurt, about five blocks over, his foot is really hurt and he’s bleeding a lot.” “Can I follow you there?” So, I jump in the car and follow her… in my comfy clothes cause I don’t expect to leave the house and sans a bra. I squeal to a stop a few feet from where he is sitting on the curb, bloody and beaten. She helps me get him in the car, he can barely walk and his face is all but covered in blood, his shirt is ripped and stained. I gather his glasses, his iPod and ear buds, making sure we have everything. Then I look at his bike. His bike won’t fit in my car. He is covered in blood. Apparently the Good Samaritan senses my dilemma and she asks if she can store his bike for me, she’ll put it in her back yard. I get her name and number (failed to give mine to her) and thanked her and took off. I got T home and cleaned up. Well, I got him stripped down and started to clean him before I went back and grabbed a pain pill for him! Then I started cleaning him up. The water in the sink was pretty dark by the time I was done. He has a gash right next to his eye, road rash down his arm, punctured palms, massively skinned up knee, scratches to both legs and an ankle that is swelling up. He hobbles to the couch and I’m like “Don’t sit down yet! Let me get a blanket under you!” You know, blood is hard to clean up! We get an ice pack for the ankle and for the knee. Thanks to Facebook I’m reminded that Erica gave me steri strips for Christmas – does she know me or what? And I pulled out the car kit that she made me and got the steri strips out and taped up the gash by his eye. I was waffling on the stitches. I wasn’t sure if it was bleeding a lot because it was a head wound and those bleed a lot, or if it really was deep enough to need stitches. And, I was waiting to watch the ankle more, see if it was broke or strained or just swollen. We finally decided that an ER visit wasn’t necessary, we’d wait and go to the doc in the morning. Yeah, I totally forgot that you can’t stitch up a wound after the fact. Tee-totally-forgot. The next morning, T decided he wanted to see the trainer at school before he’d let me take him to the doctor’s office. Okay. Works for me, the doc’s office doesn’t open for another hour anyway, so it can’t hurt anything. They confirmed that his ankle wasn’t broken or strained. He can’t wrestle until the knee heals and he can’t lift weights until his hands heal. And, yeah, the eye could have used stitches. But, since it was too late, just to continue using the steri strips. Sigh. I should have taken him in. But, then again, it worked out okay, the strips do work. And, it seems harsh, but hey, I don’t have an ER bill. I don’t even have a doctor’s visit bill! He is doing better, healing right up and doing a great job of taking care of his injuries. I’m so proud of him! Before gallery of T’s injuries. My brother has a mechanical heart. It is weird to even just say that. So, let me back up a bit and catch you up. Tuesday Lee ended up being sedated and put on the ventilator. He spiked a fever, so he was also under an ice blanket (a blanket that they run cold water through to cool the body down, sometimes ice packs are put on top of this blanket to help bring the temp down even more.). We were told Tuesday that he might not make it through the night. He stayed pretty much out of it on Wednesday – on purpose, they wanted/needed him to be sedated while he was on the ventilator as each time he would surface, he’d fight the vent. Also on Wednesday his fever broke, and then came back. And then broke again. It was decided that they would do the Right Heart Cath, no matter what!! on Thursday. Thursday. Lee’s fever came back but stabilized. The docs decided not to do the right heart cath but to just proceed with the operation for the LVAD the next day. They did discover that he is allergic to one of the meds that the surgeon wanted to use. And, thank God for the surgeon who was willing to do the surgery. Since it was such a high risk operation, apparently several turned down the opportunity. Friday. He has his surgery today. About five hours in we got the report that he was doing so very well! 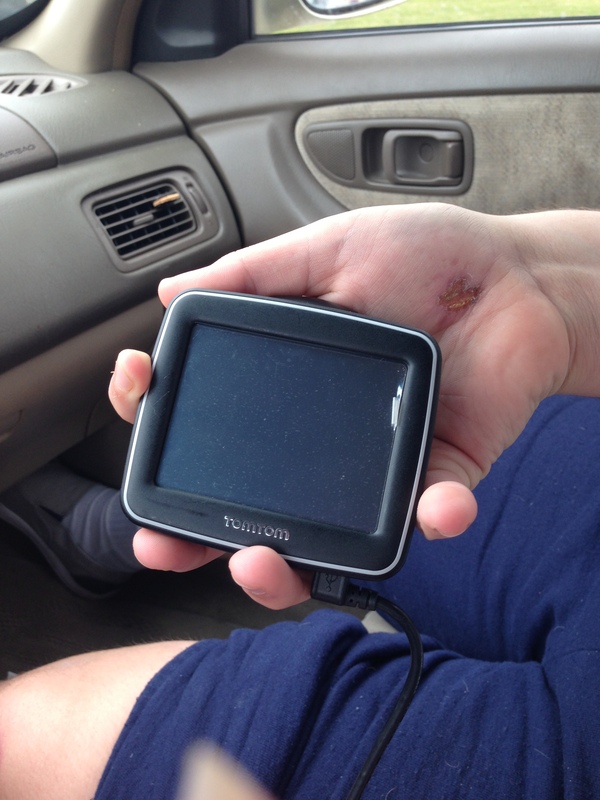 He was still open and on the table, but they had installed the device and were watching the heart respond. They were also doing dialysis to cleanse his blood of toxins and meds. Yay! This is great news. About two hours later they came back and told us that the right side of his heart didn’t hold up when they put the LVAD on, so they had to go ahead and install an RVAD (if LVAD stands for left ventricle assisted device, guess what the RVAD stands for? You got it! Right ventricle assisted device.) They were still doing dialysis, but Lee was doing very good and it would be a few more hours. The next update we got was right at 2 hours later and he had survived the surgery!! 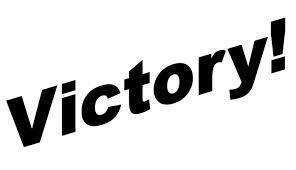 I had left the hospital by that time and dad’s text finished with “Victory!” They will monitor him closely for his vitals to stabilize and for any internal bleeding. Mom and dad got to see him briefly, and mom said that it was amazing, his hands were warm. Lee’s hands haven’t been warm for ages, with the lack of blood flow, they were always cold. So, if nothing else, we have physical proof that he has blood pumping though his body. Now, he’ll have a very rough weekend, but, what a blessing. 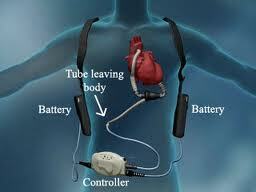 He will wear a couple of devices to keep his heart pumping and he has to plug in to recharge every night. But, having batteries to recharge means that he gets to come home! No, we don’t have a release date, but if he starts to heal, he gets to come home to finish healing. 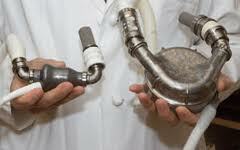 This is an LVAD – it’s bigger than you think. This is the internal and external picture showing how it works. We have four fail-safes on it in case of power failure or a short circuit. Thanks to the Mayo Clinic, you all will be the most educated people out there! Keep in mind, because the blood from the left and right side of the heart can’t co-mingle, Lee will have two of these in his chest pumping his heart for him. Oh! And, he was approved for transplant!! He has to recover from this surgery, have two teeth pulled (they are decaying and pose a risk of infection) and has to conquer the infection he has that the doctors can’t identify (and Lee is on the four most powerful antibiotics there are and the infection is still present… What’s up with that?!?). Once those requirements are met, then he will be placed on the transplant list. This is good news guys! Thanks for being there for this journey with me! I’m sure there will be more. And, I have to tell you all about Mr. T totally wiping out on his bike, and the fact that he needed stitches, but by the time someone agreed with me on it, it was too late. I have pictures!! 🙂 Tomorrow we are going to meet Graced By Emilie’s new baby brother, and then going to see the Broadway musical Wicked, followed by a stop at the hospital to see Lee! 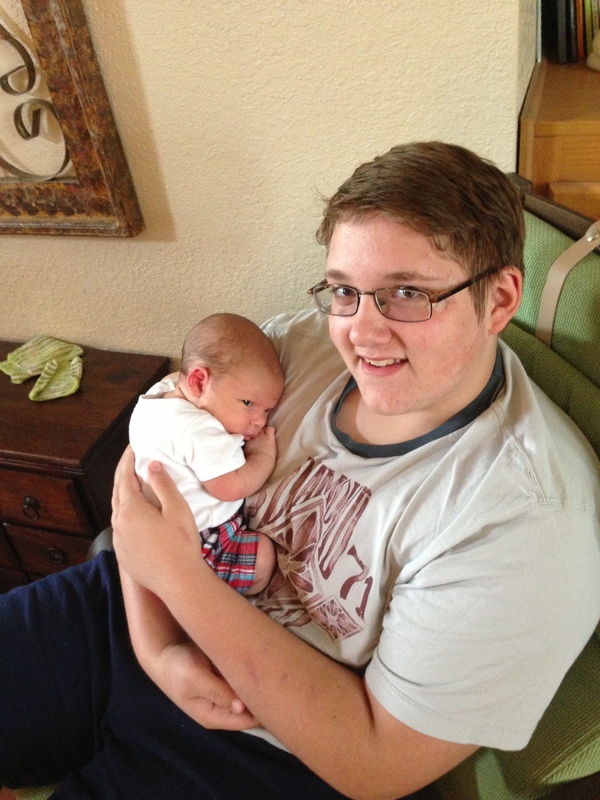 Before I give you my brilliant post – let me update you on my brother. He had a great Monday. I went and saw him Tuesday and he had a less than stellar day. I had to be home before Mr. T, so I left Dallas early. He was acting odd, ended up falling out of his chair and was struggling to get comfortable and even struggling to think and form sentences. A couple hours after I left, they ended up sedating him and putting him on the ventilator. This was devastating. While he was under, they were going to do a contract CT and see if there was something they were missing, like a blood clot, an infection, an inflamed pancreas – anything. If it was operable, the surgeon was going to take the risk and operate. In the meantime, earlier in the day a couple of departments, like Pulminology, signed off on the transplant, and one of his doctors was talking about doing the LVAD this week. Things were really looking up, despite the fact that he was having such a rough day. I let my friends and family know that things were rough and to please keep sending prayers. I let my good friends know that it was a make-or-break it kinda night and there was a big possibility that Lee wouldn’t make it through the night. The CT scan came back clear, there was nothing that they could find. And, he made it through the night. Thank God for prayers. This morning he was fighting to breathe over the ventilator, so they are keeping him sedated. He also had a fever of 102.9 so they have packed him in ice. A few hours went by and his fever is up to 104 and now they are worried about septic or cardiogenic shock. Both of those are very serious. Cardiogenic shock is a big concern. So, blogosphere, I appreciate you keeping him in your thoughts, prayers and sending good energy his way! Okay, when I was growing up, you didn’t get a letterman jacket until you were a junior in high school. In fact, I seriously remember turning my nose up a freshman who had the audacity to get a letter jacket when she was a freshman. Yeah, I wasn’t as accepting of people back then. 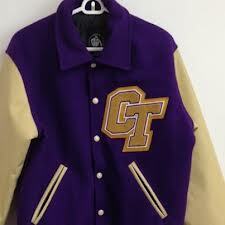 Actual letter jacket for our school… not ours though! Apparently I hadn’t fully let go of that preconceived notion, because my freshman son came home with a letter jacket order form. He has enough points to qualify for one. My jaw hit the floor. I was like, but, but, uh, what??? Really? I totally hadn’t expected this. Now, keep in mind he is at a new high school, they only allowed freshmen and sophomores in this first year and at first I thought that these kids could get their jackets early because of that fact. I was wrong. When I posted on FB about this, someone responded that their freshman girl was getting one – and they are in a different school district. So, apparently the times have changed. I never got a letterman jacket – I qualified and had the letter and patches, and my parents gave me a note for my birthday or Christmas or at some point that said that they would buy me one. But, they never mentioned it again and I never brought it up. 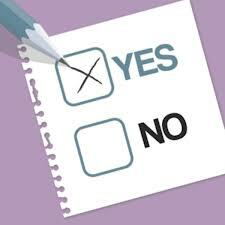 I mention this, because I started to fill out the form, and well, I couldn’t The form was smarter than I was. Mr. T and I were next to each other going over it, and what he wanted and well, I got the basic understanding, and then had to call the shop and left a message to have them call me back. I felt silly! I mean, it’s a form, for a jacket. How hard can it be? I’m telling you, it was a production! All for a jacket, that for the money I’m spending he had better wear until it falls apart. I mean, he needs to sleep in it. He needs to wear that sucker year round; I want him sweating in it during our 110 dg. summers. I’m not kidding. Okay, I’m kinda kidding. Kinda. But for the leather sleeve upgrade that he wanted, I fully expect this jacket to last. Forever and ever. Now I just have to figure out how my sewing machine works so that I can add the new patches we will get every year. 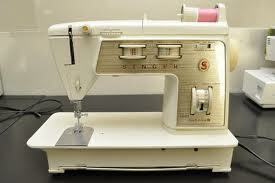 And by figure out how my sewing machine works I really mean that I have to con sweet talk my dad or Karaboo. Did a quick search of 1970’s sewing machines and look – it’s mine! 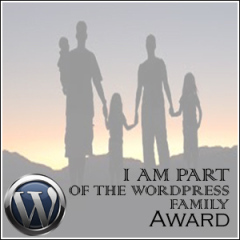 Now, onto the “I am part of the WordPress family award”. I teared up when I read what Jess wrote about me when she nominated me. It could be lack of sleep and emotional stress, but all the same, she wrote the sweetest blurb and it touched my heart. You should go read it, and more of what Jess writes about here. She’s even been featured on Freshly Pressed! I’m amazed and awed by her writing, and love that she takes on all topics from autism to how we really need Lego to invent a Lego vacuum, which I think is genius! This is an award for everyone who is part of the “WordPress Family.” A blogger named Shaun started this award on the basis that the WordPress family has taken him in, and showed him love and a caring side only WordPress can. 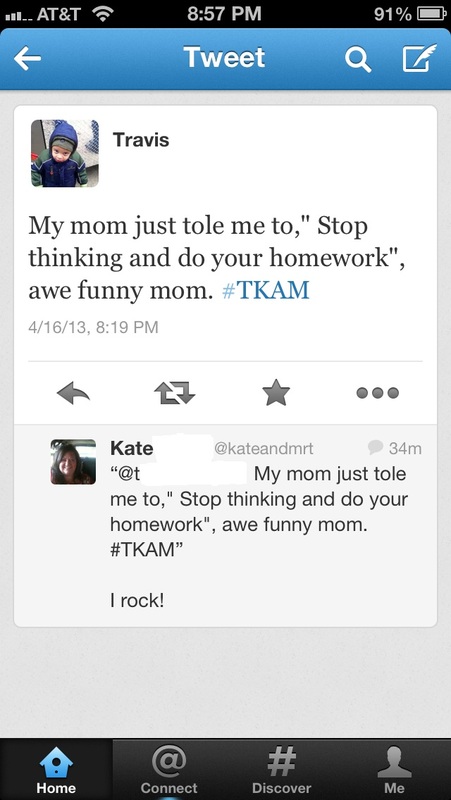 The way people take a second to be nice, to answer a question and not make things a competition amazes him. He has been given many awards, but he wanted to leave his own legacy on here by creating his own award, as many have done before. 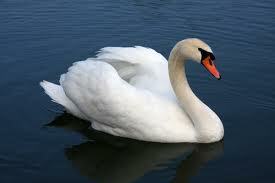 This represents “Family” we never meet, but are there for us as family. I love this award, as we all can win and be a part of it. This award resonates with me as I have made some great friends on WP, and have seen more love and support from you guys than I ever expected. I really thought that I would be just another random person on the blogosphere, but instead, I’ve made real connections. I look forward to seeing what is happening in your lives and I am just narcissistic enough to really enjoying sharing my life with you! Now, I’ll give you the rules, but be warned, I’m not going to follow them! 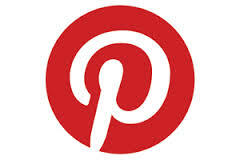 The Rules: (1) Display the logo on your blog. (2) Link back to the person who nominated you. (3) Nominate 10 others you see as having an impact on your WordPress experience and family. (4) Let your 10 family members know you have awarded them. I’m not going to come up with 10 people, I’m going to just go with my heart on this one and mention the people that have become my WP Family and shown me the love and support that I feel embodies this award. Who or What was That is a blog by Karaboo. She’s also a friend in my real life, so I have the pleasure of having lived through some of her blogs! Her writings are funny, witty and insightful – and excellent cause I’m mentioned in them occasionally! Recently she wrote about the fact that she was about to leave town for a business trip and how her family was planning for the end of the world. It’s pretty funny, and spot-on accurate! Me, Myself and Kids technically doesn’t qualify anymore. Larry has grown so big he has his own website now that hosts his blog; however, he started on WP and he has been one of my biggest supporters. And, actually, I hear this about Larry all of the time, that he’s been there to give us a push when we need it and a pat on the back when we deserve it. To me, Larry is the embodiment of the family on WP, plus, he’s a brilliant writer! He and his wife and two kids live on the East coast side of things, and I’m learning a lot about public transportation through him! 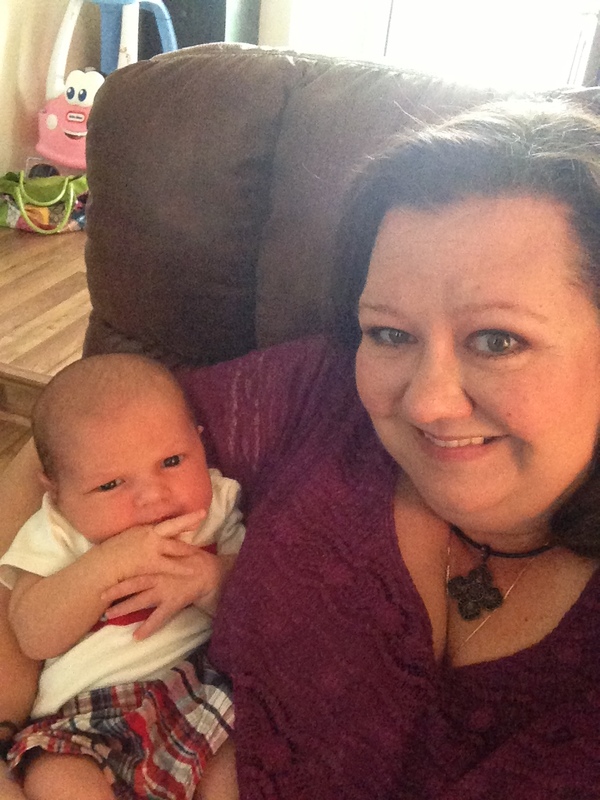 Surviving The Madhouse is a blog by one of my new favorite people, Holly. Not only do we share a very similar taste in movies, she is awesome and supportive and really helps me indulge in my obsessions. Her Random Ramblings are some of my favorite reading times because I know that she is going to be honest and real and make me laugh and make me cry – sometimes all in the same post! You Caught Me Sitting Still is a new blog by Kari, and friend of mine from a long time ago. We spent hours and hours together everyday volunteering at the hospital when we were both in high school and a great friendship developed. She lives in Alaska with her husband and dogs and goes to school and has recently starting working out. Her journey has cracked me up and I love that she is documenting it – it makes me feel great that I’m not the only one that struggles! Now, there are many more of you out there that have inspired me, such as Motherhood is an Art and My Journey to Live an Authentic Life , but I am stopping at five official ones because this is insanely hard to do and my boss is eventually going to notice that I’m not working! So, BA cancelled lunch on me today. Which I kinda expected. But, since it was work related, I guess I’ll forgive him. Actually, he rescheduled for Monday, so, that’s that. Oh, and at the end of the conversation he told me that he’s been saving a story for our face time. (He communicates better face to face, so he saves up stuff to tell me!) Anyway, now I have all weekend to wait to find out what the story is!! Agh! Seriously, you all know that will drive me nuts! Lee did not have the right heart cath done today. His INR was too high… means his blood is too thin and may not clot. They couldn’t risk putting the cath in and having a bleeding event. They thought about putting some fresh frozen plasma in his body to thicken up his blood; however, that would skew the results of the test, so yeah – it was veto’d. They did a different test using his picc line. I’ll come back to that. He’s also developed a bump/growth type thing on his left side and it is very tender and causing pain. He had another CT scan today to see if they could find something that was missed in yesterday’s CT scan to tell them what it is. Nope. Nothing showing up. No one knows exactly what it is or how to fix it. His potassium and sodium levels did drop, so he was able to skip dialysis today. His nephrologist wanted to give Lee a break while he could. His BNP (the test that tells you if you are in heart failure or not) dropped significantly From 4000 yesterday to 2900 today. Or maybe it was 2400. Anyway, it went down. Keep in mind, in a normal person, BNP measures 100. You read that right, I didn’t miss a zero. Normal is 100. Lee is 2900. Or 2400. Take your pick. Back to the right heart cath that didn’t happen. I don’t know what the results were. All I know is that this afternoon mom texted me that Lee is being moved to UNTSW. UNT Southwestern Medical Center. Per their website “UT Southwestern is widely recognized as one of the nation’s leading heart disease treatment and research centers, dedicated to providing the very best care and committed to the discovery of new knowledge that will help tomorrow’s patients.” Personally, I don’t care about tomorrow’s patients. I just care about today’s patient. He should be transported this evening. They are taking him via Care Flight, the air ambulance, cause they can’t risk the ambulance getting stuck in traffic. The good news is that UNTSW really IS a leading heart facility and they have more experts to help Lee. The bad news is that it is in Dallas. I live in FW. For those not familiar with the D/FW Metroplex, and especially those that live on the East Coast, that’s an hour drive in no traffic. An hour and a half in rush hour, easily. Everything is bigger in Texas, to get from one side of the Metroplex to the other is like driving the entire state of Rhode Island from north to south. Okay, I made that up. But, I bet if you map it, you’d find that I’m pretty darn close! On a totally different note, I did get the house cleaned today. Well, the parts of the house that I use anyway… I didn’t do T’s bathroom, which since it is the guest bathroom, I probably should have, but I cleaned the toilet earlier in the week, and he can pick up his own dirty clothes and wipe down the counter and sinks. Plus, I don’t have any company coming over… so no one will notice! But, I did get the dusting, sweeping, vacuuming and mopping done. That makes me feel happy. Yes, I’m weird. Lastly, I refuse to blog this weekend. But, since I’m addicted to you guys, I will check in and read what you blog! Oh, and thank you guys so much for the outpouring of support and love and prayers! I may not always respond – but I am hearing you!! And, because I like to include pictures, here are some of Lee. 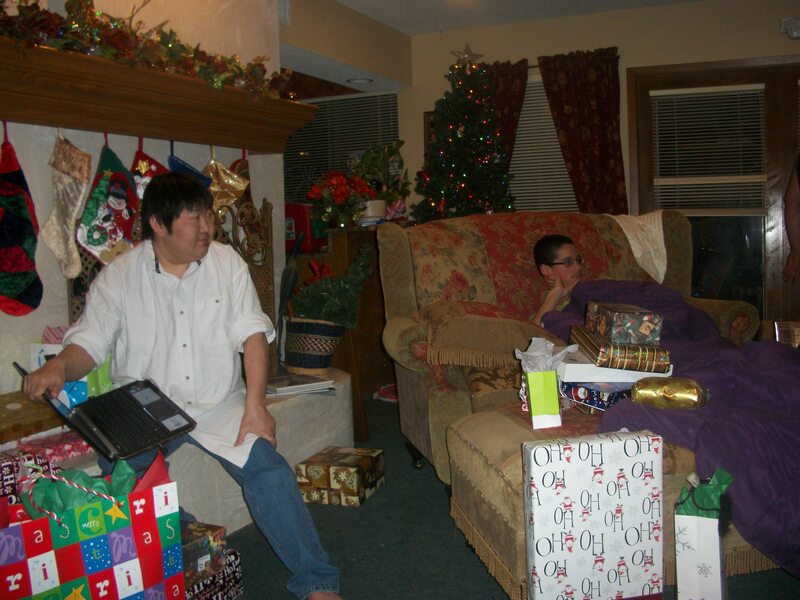 Lee at Christmas this year. Lee and our sister Amy at Mr. T’s BD party last year. 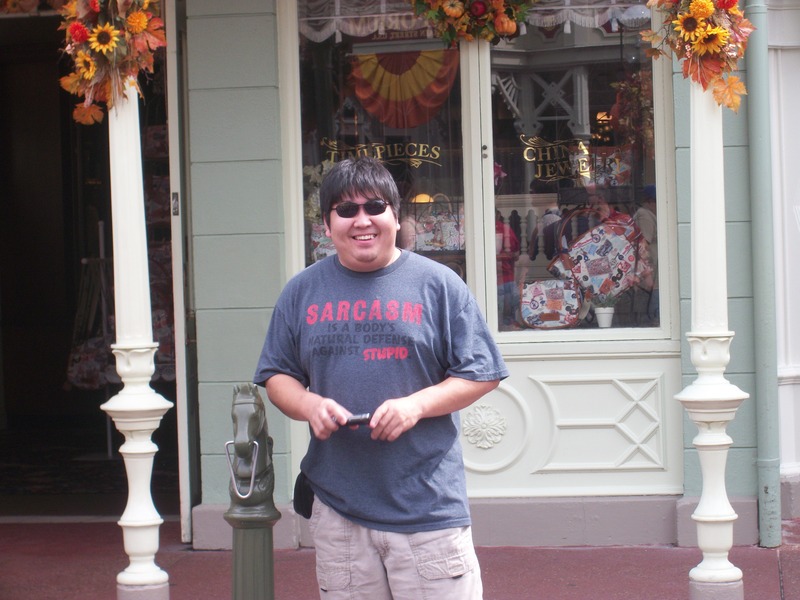 Lee in 2011 at our family vacation to Walt Disney World, before he had been diagnosed. Today Lee had a CT, as his labs keep showing that he has an infection, but he is on antibiotics and doesn’t have a fever. They didn’t really find anything. He went down and had more dialysis done today, since his other numbers were still high. My understanding is that his body isn’t functioning like they expect and his labs keep going up and they don’t know why. I’m hoping that all they are doing is going to find a reason, or short of finding a reason, at least a treatment. I don’t know. All I know is that I know I’m tired of the ICU, and I get to go home everyday. I feel so sorry for Lee having to be there everyday. Not being able to even walk the halls for some change of scenery. But, like I told him the other day, being miserable over it won’t help anything. So, we will just keep asking for prayers and praying ourselves. What will be will be. My goal is to just help him and my parents out the best I can. On a different note, my completely modest brother has become an exhibitionist. Part of it is that he’s out of it so frequently he doesn’t realize he is exposing himself all the time, part of it is that he’s just so uncomfortable and I’m sure part of it is just the fact that he doesn’t care anymore! All I know for sure is that I’ve spent the last two days hopping up to cover up his junk before he scared away dietary and environmental services! Tomorrow is Friday and I have a late lunch with BA scheduled, and I’m really looking forward to it. It will be nice to get away for a bit. Then, mom gave me Saturday off – I didn’t even ask or bring it up – but since she did, I’m planning on spending the morning with Mr. T and then the afternoon with my girlfriends. Recharge my batteries! 🙂 Thanks for coming along on this journey with me guys! You’ve been awesome! That sounded like I am leaving. I’m not. You aren’t that lucky!